Hoevenaars LGV BV, a top live event production company located in the Netherlands, recently added Adamson Systems Energia E15 enclosures to their production inventory. "We were looking for a new stadium size line array system to take our sound department to the next level," explains Patrick Hoevenaars, CEO of Hoevenaars. "The transparency, range, headroom and sheer SPL of this system is just amazing. As soon as we heard it we were sold." The new line arrays were immediately put into service for the "We Love The 90's" concert held in Goffertpark Nijmegen in the Netherlands. More than 23,000 people were in attendance for the eight-hour celebration of the music of that decade. The audience was treated to live performances by many popular artists from the 90's including SCOOTER, Paul Elstak, Captain Jack, Flamman & Abraxas, 2 Brothers on the 4th Floor, and DJ Flo. 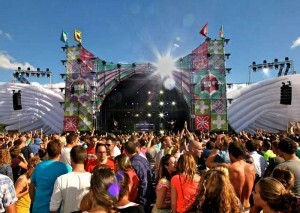 Hoevenaars specified two arrays – each consisting of 12 E15s – for the main PA of the outdoor event. The arrays were hung in scrim-covered scaffolding located to the left and right of the stage. Two more Energia arrays, this time consisting of 6 E15s each, were flown further down from the stage for outfill. Lab.gruppen PLM amplifiers with integrated DSP were chosen to drive the system. Due to its high integration and performance the PLM platform is a perfect match for an unpowered Energia system. "The sound for the show was incredible," adds Hoevenaars. "It was a large audience to cover and it sounded terrific throughout the entire area – even far away from the stage. The artists were very pleased. This is a great addition to our rental stock – I'm sure it will help grow our business." In picture: Hoevenaars utilized a total of 36 Adamson Energia E15 line array modules to full reinforce the "We Love The 90's" concert.